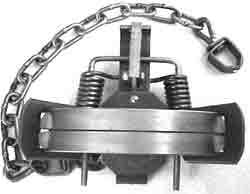 Features round jaws, round pan with 12" chain and swivel. Side anchored, sets 1-1/4" off ground. Ideal for fox, raccoon, opossum and fisher. Trap features regular jaws.